March 31, 2017  Former national security adviser Mike Flynn says he would testify to congressional committees in exchange for immunity. President Trump encouraged him to try to make such a deal. March 29, 2017  The chairman and vice chairman of the Senate Intelligence Committee briefed reporters on Wednesday about their investigation into President Trump's potential connections to Russia's election meddling. March 24, 2017  Former Trump campaign chairman Paul Manafort has volunteered to testify before the House Intelligence Committee as part of its investigation into potential ties between Trump aides and the Russian mischief in the 2016 presidential campaign. But partisan rancor and unusual revelations threaten to derail the committee's investigation — or at least, per critics, its credibility. March 23, 2017  The fallout continues Thursday after the chairman of a House panel investigating President Trump's connections to Russia revealed that Trump and aides might have been swept up in "incidental" surveillance. The chairman, Rep. Devin Nunes, reportedly apologized to the committee, and its top Democrat, Adam Schiff, and all but confirmed a CNN story suggesting there's more than circumstantial evidence tying the Trump camp to the Russians. March 22, 2017  House Intel Committee Chairman Devin Nunes says then-President elect Trump and members of his transition team were captured by U.S. surveillance as part of "incidental collection" when members of the incoming administration phoned foreigners being watched by American intelligence. That is not a "wiretap" but the White House has a new opening to persist with charges that then-President Obama surveilled Trump in the past. March 20, 2017  Members of Congress on the House Intelligence Committee questioned witnesses on Monday about the role played by Russia in the 2016 presidential race, including its potential ties to the Trump campaign. March 17, 2017  Secretary of State Rex Tillerson has raised the prospect of pre-emptive action as a way the U.S. and its allies could deal with the threat of North Korea's nuclear missiles. NPR takes a look at the state of the North's nuclear and missile programs, and what kind of conventional threat it also poses to its neighbors. March 16, 2017  Investigations into Russian election meddling and Trump's claims of being wiretapped are getting underway in Congress. But Democrats and Republicans aren't on the same page. March 14, 2017  President Trump has reportedly reversed an Obama-era policy of giving more responsibility for terrorist drone strikes to the Pentagon. The CIA will resume more responsibility for not only generating intelligence but also conducting strikes — and reaction in the national security world is mixed. March 10, 2017  A U.S. general says Russia has violated a longstanding arms control treaty by deploying new missiles. It was the first official, public assertion that these missiles are fully operational. March 9, 2017  After weeks of reports that Russia is violating a nuclear arms treaty with the U.S., the Pentagon says that is indeed the case. Top nuclear arms officials are telling Congress that Moscow is deploying prohibited intermediate range nuclear weapons that could be used to attack Europe. 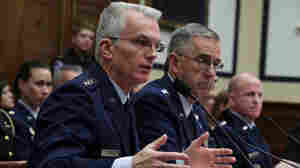 It's another nuclear headache for a new administration also grappling with defiant nuclear weapons moves by North Korea. March 2, 2017  On Capitol Hill, news about the attorney general came as the House Intelligence Committee agreed on the scope of its investigation into Russia's meddling in the 2016 presidential election. March 2, 2017  Committees in Congress are gearing up to conduct their investigations into the role Russia played during the 2016 presidential campaign — and the ties it may have had to the man who won it. March 1, 2017  President Trump ridiculed his predecessor and Hillary Clinton for refusing to use the term "radical Islamic terrorism." Turns out his new national security adviser, Gen. H.R. McMaster, is also opposed to using the phrase since he finds the groups the U.S. is fighting in the Middle East not Islamic. But that has not stopped Trump from repeating it, to the delight of his base.